One of my goals for the end of 2012 was to clear up our old ice cream stock. I'm happy to say the family did a good job pulling together to accomplish this task. We broke open this particular treat on New Year's Eve. 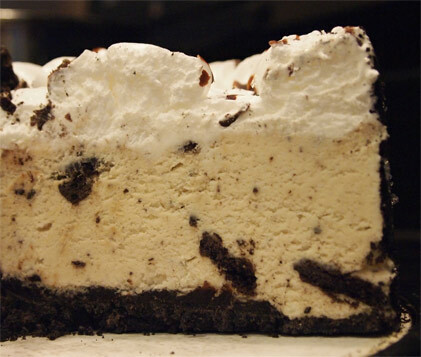 I'm guessing you can't read that description so here it is "Creamy vanilla ice cream loaded with chunks of chocolate sandwich cookies, on a fudge-topped chocolate cookie crust, topped with whipped topping, more cookie pieces & chocolate flavored drizzle". 40oz total or enough to completely fill 3 people 3 times. While the description is blurry, you still might have noticed that the best by date is Jan 12 2013. It's not that this cake expires quickly, it's that we bought it over the summer. Whoops. It's funny how a closeup seems to distort how this treat really looks. I don't mean it makes it look bad, the chocolate drizzled whip cream looks very cool close up, but it just looks so tiny! Ok, here's the less appetizing yet more functional shot for ya. We've got lots of whip cream up top, you already saw the drizzle on top of that, and then we've got a big thick layer of cookies & cream ice cream with giganto wafer bits still intact. It's nice because you really need that visual pop in a cake like this. There are cookie crumbs on the outer edge and a big thick chocolate wafer cookie crumb bottom. Sounds good right? But do you see something else in the photo? down near the bottom? It's the fudge topping on the crust! Very cool Mr. Donaire, always taking things up a notch. When you have such a loaded description on a cover, it's easy to lose track of an ingredient whether it be physically or verbally, but it's here in full effect and what a fun ingredient it is. It's a rich, thick fudge that adds a flavor pop that lets you know this is a cake and not just another bowl of ice cream. First scoop, second scoop, third scoop, they were all tasty. Even at the end of it's shelf life, this one was still putting smiles of our faces despite a little bit of old funk here and there. I don't think Jon Donaire has ever let us down and I look forward to whatever they have in store for 2013. Thanks for the review. 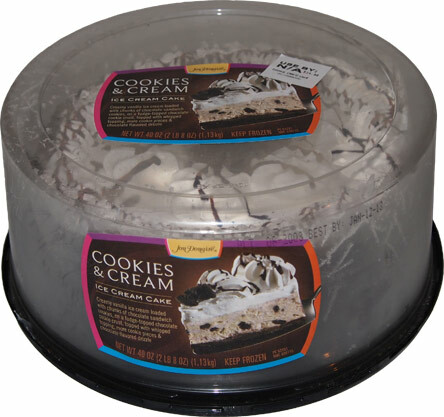 I always see these at the store and hesitate to pick one up. I shall hesitate no more! where might i find one of these cakes? I just picked up and ate the Turtle version and man was I surprised. 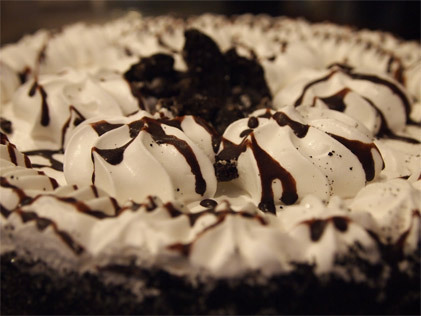 I used to work for Dairy Queen as a teenager and this cake, mainly the fudge and chocolate crust took me right back there. The caramel was amazing and is something I usually don't go for but the chocolate anchored it. A must try!